Speaking of screen fluency, you should check out this video of an intuitive 3D sketching pad demo. 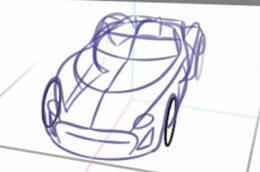 Using a large-screen touch-sensitive Wacom tablet-screen, an artist can produce 3D sketches as fast as he/she can draw. The software, called ILOVESketch, appears to be experimental, but I would imagine that the folks producing special effects would be the first to pick it up when it goes commercial. Also industrial designers. With quick strokes of the pen you can build a complex curvy shape (not just the blocks that Sketchup does) faster than you could sculpt it in clay or in CAD. This is one of those technologies that people have forever said “they ought to invent this.” It almost seems like magic. Combine this with 3d printing and that would be a real winner. This is an impressive example of that so very elusive prey, the truly intuitive computer program. I like how you get rid of a line: scribble it out. Intuitive. It’s clear the software is designed to design things that have bilateral (mirror) symmetry; this is fine, since so much of what you might want to design has that symmetry.